Back in late December, I made the first version of a beer intended to be handed out as a favor to guests at my step-son's wedding. That beer was loosely based on a New England IPA recipe I'd found, but the hops were all swapped out for those with a decidedly citrus flavor. The resulting beer turned out more like a traditional American IPA than a New England style IPA (NEIPA). The American Homebrewers Association posted a recipe for WeldWerks Brewing's Juicy Bits NEIPA that sounded much more like what I was looking for. WeldWerks uses a blend of Citra, El Dorado, and Mosaic hops. With Mosaic often used interchangeably with Citra, I decided to remove Mosaic from the equation to keep things simpler. I also decided to drop El Dorado during the boil and go with an El Dorado hop extract in the dry hop phase. Why only use Citra? Aside from the simplicity of eliminating one hop from the ingredient list, Kegerator.com describes Citra as "The Most Citrusy Aroma Hop in the World of Beer" and my step-son and his fiancee wanted a very citrus-forward beer. I won't use Citra for bittering since it's described as having a harsh bitterness, and I wanted something a bit smoother. 0.35 ounces of Citra @ 13% AA at 10 min. 0.65 ounces of Citra @ 13% AA at 5 min. 1/4 tsp. Yeast Nutrient at 10 min. After this, bottle the beer with enough sugar for a medium level of carbonation. 02/24/2019: Late in the main (149F) mash step, before the sparge began, I measured the pH at 5.6 and the gravity at 14.5 Brix on my refractometer, which is roughly 1.061 SG. The pre-boil gravity measured 1.042 SG, at which time the first wort hops were added in a fine mesh hop spider. While 1.042 SG was lower than my expected pre-boil gravity of 1.046 SG, I opened the lid of the Brewie+ to ensure that we got a bit more boil-off than usual. Hopefully that would get me to the desired final gravity. When we got near the end of the boil, the gravity of the wort measured much lower than the 1.061 SG I had planned for. I added 7 ounces of Brewers Crystals to get the gravity up to 1.051 SG. Volume in the fermenter turned out to be 3.8 gallons at 1.051 SG. This is about 1.3 gallons more than anticipated and about 10 points low in gravity. Given the design of the Brewie+, it's not possible to go back and boil off the excess wort, so I had to live with the lower gravity. I took 3 Liters of the "over-brew" and poured it into a large 5L Erlenmeyer flask. Two-thirds of the 1 Liter yeast starter I made yesterday was pitched into the fermenter (which contained just over 3 gallons of wort) and the remaining third into the flask. The flask was placed on a stir plate with a large stir bar. It will become a large starter for my next batch using this yeast. 02/25/2019: Gravity in the 3L "starter batch" is down to 1.017 SG, which represents 66% attenuation and 4.46% ABV. It has only a few more points to go before it can be considered to have reached final gravity. Gravity in the 3-gallon "main batch" is down to 1.036 SG, which represents 27.45% attenuation and 1.84% ABV. 03/01/2019: A half-ounce of Citra pellet hops was added to dry-hop the beer before bottling. It has a very cloudy orange-juice-like appearance to it, with a very citrusy flavor from the Citra hops. I plan to add some El Dorado extract for complexity prior to bottling. 03/03/2019: Gravity is now reading 1.004 SG and temperature is reading 1.003 SG in the main batch. It's interesting to note that in the smaller stir-plate batch, the gravity is reading 1.010 SG and has held there for a while. It's as though there's something different going on in the larger batch (which does still seem to have a krausen on top of it). A taste test from the main batch showed a decidedly citrusy (almost orange-juice-like) flavor. 03/04/2019: 1 ml of El Dorado hop distillate was added to the fermenter and allowed to mingle overnight before bottling. 03/05/2019: Tonight the beer was bottled with 12 small carbonation tablets per bottle (high carbonation) in 22-ounce bombers and placed in a sealed box to carbonate for a week before delivery to the future bride and groom for taste testing. It should be carbonated nicely by 3/12/2019. 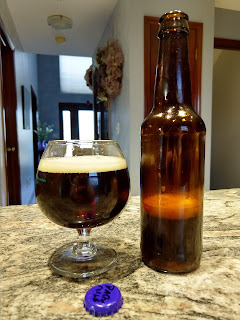 Last year, I made an Irish Red Ale recipe of my own. Although it turned out fairly well and only a couple of bottles remain, when I saw Gordon Strong's Irish Red Ale recipe, I decided I'd like to try it to see how it compared with mine. I adjusted the recipe for a smaller volume batch and the efficiency of my brewing system, which results in the recipe you see here. 02/03/2019 3pm: Loaded the ingredients into the Brewie+ and entered the recipe details. Brewie estimated a brewing time of approximately 6 hours. 9pm: I ended up with almost 3 gallons in the fermenter, plus over half a gallon in another (hastily sanitized) fermenter. The gravity came out at 1.030 SG instead of the expected 1.041 SG. That combination (volume and gravity) reportedly represents a 66.2% brew house efficiency per BeerSmith. Unfortunately, it drops the beer's original gravity well below the style's 1.036 SG lower limit. I probably could have resolved this by transferring the wort into another kettle and boiling it down until the desired gravity was reached, but I chose not to. It's going to give me a chance to conduct two experiments as it is. I've pitched Mangrove Jack's MI5 Empire Ale yeast into the main fermenter, and some Safale US-05 into the smaller secondary batch. That will allow me to test two different yeast strains on the same wort. I also extracted a sample from the secondary fermenter and pitched some MI5 yeast into it to conduct a forced fermentation test to see if the final gravity achieved in that test compares to the final gravity in the main batch when it is finished fermenting. That knowledge will be useful when I do future high gravity beers. 02/04/2019 9pm: The gravity has dropped from yesterday's 1.030 SG to 1.012 SG today. 02/05/2019 9:35pm: The gravity is currently registering 1.010 SG and the temperature is reading 61F. 02/09/2019: A refractometer measurement of beer from the fermentation test vessel registered 1.014 SG. The main fermentation vessel has finished primary fermentation (and did so fairly quickly) and is registering 1.009 SG today. Since there is some rounding and estimating that takes place in the refractometer scenario, I'm planning to drop a Tilt Hydrometer in there before tossing that beer, just to see how close the readings are with the same method. The main batch has been reading 1.008-1.009 SG for four days now, so I am confident that primary fermentation is over and it will be time to do some fining and then bottle it. 02/12/2019: The beer is registering 1.008 SG in the primary fermenter, at a temperature of 59F, which is pretty much the ambient temperature in that part of the basement right now. A reading from the Tilt Hydrometer dropped into the wort from the fermentation test vessel also registered 1.008 SG, proving that the technique works. This will be useful when doing higher-gravity beers, by allowing me to bottle those when they're 3-4 gravity points from final gravity. 02/17/2019: Today I bottled the two variations. The batch brewed with Safale US-05 registered a final gravity of 1.015 SG. The version using Mangrove Jack's MI5 Empire Ale yeast registered 1.008 SG. A small sample from the fermenter showed that the US-05 version was clearer but the roasty malt flavors were muted. The MI5 version seemed more tasty and "British" to me. Both variations were bottled with six small carbonation drops per bottle. The English Dark Mild Ale is a style I first encountered several years ago at The Winking Lizard location on Bethel Road, a location that sadly is no longer open. The one I tried back then was Cain's Dark Mild, and I found it a very enjoyable beer. In 2018, I made my first attempt to brew the style. I thought it turned out well, but wanted to try again. Jamil Zainasheff's book Brewing Classic Styles contained a recipe for a Dark Mild Ale named "Through a Mild Darkly" that was similar to my 2018 recipe but different enough that I decided to try brewing it. My first attempt was a failure, caused by an oversight on my part that resulted in the wort being ruined and discarded. Today's attempt was more successful. The fermentation plan is to allow the beer to free-ferment in a cool corner of the basement. 02/02/2019: The brew went well, without any mishaps or problems. The wort came out one SG point above the estimate. Volume came out a big above the estimate, implying a greater efficiency than I've been estimating previously. Wort temperature in the fermenter registered 74F, so I chose not to pitch the yeast right away. I placed the fermenter in a colder (approx. 62F) section of the basement overnight to cool down. 02/03/2019: The beer is now registering a temperature of 62F. This is below the yeast's recommended fermentation range (which is 65-72F), but that should be just fine. 11:45am: I pitched a full package of Lallemand ESB yeast directly onto the 62F wort. At the time the yeast was pitched, the gravity registered 1.040 SG. 02/04/2019 9pm: Gravity has dropped from 1.040 SG to 1.014 SG today. 02/05/2019 9:38pm: Gravity has dropped as low as 1.009 SG but currently reads 1.014 SG and the temperature registers as 63F. A sample extracted from the fermenter was very dry and grainy, so the beer may be at its final gravity. 02/12/2019: Gravity is registering 1.015 SG now, at a temperature of 59F, which is the ambient temperature in that part of the basement right now. 02/17/2019: The beer was bottled today with six small carbonation tablets per bottle. 02/24/2019: The beer has a beautiful deep ruby reddish brown color with thin off-white head. Aroma is roasty, chocolatey, and a touch nutty. No hops in the aroma (consistent with the style). Flavor is malty, roasty, Mouthfeel is light-to-medium. Finish is mildy roasty. There is a subtle tartness in it as well.